If you're new to baking, cookie recipes are a good place to start learning and practicing your skills. Drop cookies are mix and heat, while cut-out cookies, also referred to as rolled cookies, require a little more time and effort. Either way, you know you're getting something sweet and delicious in the end. 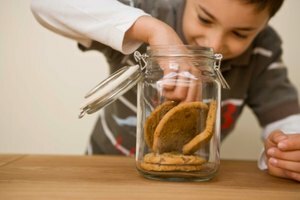 The dough used to make both drop and cut-out cookies is very similar, according to Michel Suas author of Advanced Bread and Pastry. Both are thick and sticky, but drop cookie recipes tend to create a batter that's a little softer, so it's easier to transfer from mixing bowl to cookie sheet. The firmer cut-out cookie dough, however, helps the cookie maintain its shape while cooking, and also helps it withstand the additional stress from the rolling pin. 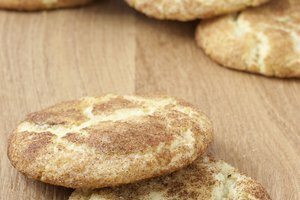 The slight differences in batter and preparation affects the texture of the two cookies. A drop cookie tends to be soft and chewy, while a cut-out cookie tends to be soft and crumbly. Both are sweet, as cookies should be, but sweetness may vary depending on your recipe. With cut-out cookies you have more control over what they look like based on the shape of your cookie cutter. Drop cookies, as long as you've dropped them onto your cookie sheet in a nice mound, form a circle shape when cooked. With drop cookie recipes you can add ingredients to the raw dough to vary taste and texture. 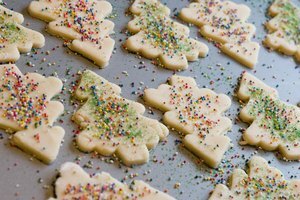 For cut-out cookies, decorate the cookies after they're baked and cooled.